In recent times, Indian govt is taking steps to ensure that policy framework around conducting business in India and abroad by Indian companies gets easier. Though, we still have a long way to go before we reach acceptable levels, it is heartening to see Govt taking to make life easier for businesses. In a recent development, the center is doing a pilot, where it will allow unlisted companies that are incorporated in India to directly raise capital abroad without the mandatory requirement of prior or subsequent listing in India. 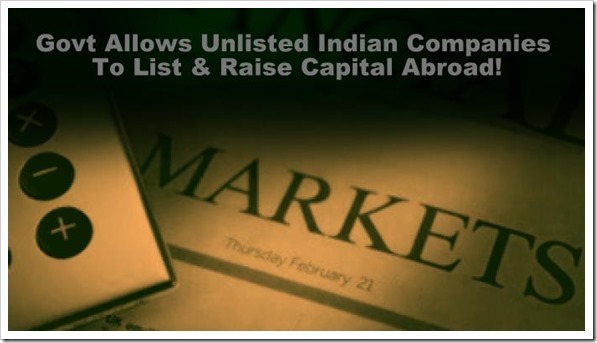 Till now it was not possible for unlisted Indian companies to directly list in overseas markets. This is a significant development for Indian companies who want to raise capital abroad via IPO route, but are not listed on any of the Indian bourses. For example, if a Cleartrip or Flipkart did not want to do an IPO in India, but wanted to raise money through an IPO abroad, can now easily do it. In addition to this, once they have raised money abroad, there is no mandatory requirement for them to list in India, which was not the case prior. The center is running this scheme on pilot basis for two years, after which they will review the impact of arrangement and make further decision. The company will adhere to SEBI’s disclosure requirements and will need to file a copy of the return to SEBI for the purpose of Prevention of Money Laundering Act (PMLA). The capital raised abroad may be utilized for clearing outstanding overseas debt or for operations abroad including for acquisitions. If the funds raised are not utilized abroad fully, they will need to remit the money back to India within 15 days and such money shall be parked only in AD category banks recognized by RBI. The last point may be a deal breaker for a few, but nevertheless, it is still a great move by center to come up with this pilot scheme. This surely will be quite attractive to companies who are looking to expand their horizons abroad. The Finance Ministry, DIPP and RBI will soon be issuing necessary notifications in order to implement the required changes to the existing rules.